A sharp cold front will move through the Midwest tomorrow afternoon and evening. 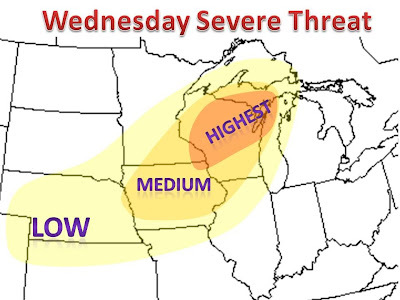 Along with the temporary relief to the heat and humidity, the threat of a severe weather outbreak is looming larger and larger. Computer models are spitting out some high severe threat numbers and with enough daytime heating storms will pop. Tornado parameters are low, so the main threat will be large hail and damaging winds. Be sure to check tomorrow, if any updates are needed.